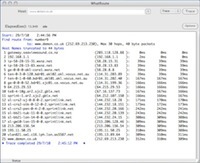 WhatRoute is a network diagnostic utility designed for Apple Macintosh computers. Primarily it provides a Traceroute function, but can also perform Ping, Domain Name Service queries, Whois queries and monitor the traffic to and from your computer. The software also uses a Geo-Location service to provide a geographical view of the paths that packets from your computer take as they traverse the Internet. I found this video presentation of WhatRoute while doing some vanity searches. The video refers to WhatRoute 1.x.x but is still mostly applicable to the current release series. Well done Ricardo and if you feel like updating it, please let me know. WhatRoute was originally developed in 1996, to run under MacOS 7.5.3 using the (at the time) newly released Open Transport TCP/IP stack. There was no other software for the Macintosh that could perform Traceroute or Ping, although the functionality was provided on both Windows 95 and Unix platforms. How embarassing was that? WhatRoute was the first piece of software to bring these networking utilities to the Macintosh. In 2001, Apple released MacOS 9 and included WhatRoute with that release of the operating system. 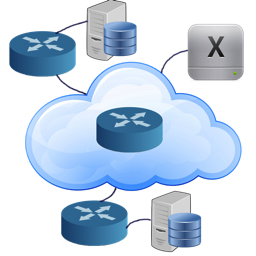 With the Unix based MacOS X, Apple released a native application, Network Utility, that could perform most of the functions provided by Whatroute. However, following requests from many users, the software has once more been updated and is now available as a Universal Binary Application. Intel x86 is the 3rd major hardware architecture that WhatRoute has supported (previously Motorola 68K and Power PC) and of course there has also been a major change in the software environment from MacOS Classic to the current Unix based macOS. After the initial development of WhatRoute, I became interested in trying to understand something of the geographical locations of the various routers that lay between my computer and the eventual destination of my IP packets. I soon found the CAIDA organisation at San Diego, CA, made contact with them and was given access to their NetGeo IP address to physical address database. Kim Claffy (kc) and David Moore were very helpful and supportive in these efforts although I dont think they had quite understood the load that would be placed on their servers when they agreed to giving WhatRoute access. Sorry about that. Eventually CAIDA ceased to maintain their free database and it became less and less accurate. I was in no position to purchase a commercial service for use in a freeware utility, but a little research led me to the GeoLite City database at www.maxmind.com. WhatRoute currently uses this database and although the results are sometimes inaccurate, in general they are good enough to give a feel for the geography of the Internet. Many WhatRoute users have requested a higher resolution map than the one I provide in the software. This current release of WhatRoute will pass geographical locations to Apple Maps or Google Maps for a detailed view. ... please consider making a $15 donation to ensure the ongoing development and maintenance of the software. Use JSON for cache data. Rebuild with Xcode 6.0.1 for Yosemite. New helper program. Intel only. Better handling of DNS timeouts. Adjust the number of active CPUs on your computer. Squawker is a small program that listens for log and warning messages from monitored servers. It uses Text-To-Speech to read the message aloud, and also logs it into the Macintosh system log.